The image above, taken from a postcard dated to circa 1910, reveals a Darling Harbour which is very different to the one we are all familiar with today. In our modern Sydney, Darling Harbour is a tourist hub full of restaurants and tourist attractions, but once it was at the heart of the working harbour. One of Darling Harbours original European names was Cockle Bay, referencing the remains of shellfish which were scattered along the shore, remnants of many feasts held by Aboriginal people in the place they knew as Tumbalong. These middens provided a valuable source of lime for the Europeans and the area soon became the domain of the lime burners who provided the much needed resource for making mortar. The valuable harbour area was quickly recognised though and by 1815 Australias first steam engine was hard at work and by the 1820s shipyards, wharves, warehouses and factories were being built along the foreshore. In 1826 the name of the area also changed with Governor Darling naming the cove after none other than himself. Throughout the 19th century and into the 20th Darling Harbour saw wool, wheat, coal and timber come and go from its wharves and warehouses. In fact by 1900 shipping was the main focus of the area with a multitude of wharves and warehouses replacing many of the small scale industries and factories. In 1900 the Government resumed Darling Harbour and assumed control of the many wharves but the working harbour continued to thrive with ships coming and going full of goods for import and export. By the end of the Second World War though coastal shipping was declining and Darling Harbour was seeing less trade. In 1984 the industrial history of the harbour concluded, with the area being returned to the people of Sydney and in 1988, just in time for the Bicentennial celebrations the new Darling Harbour was opened to the public. 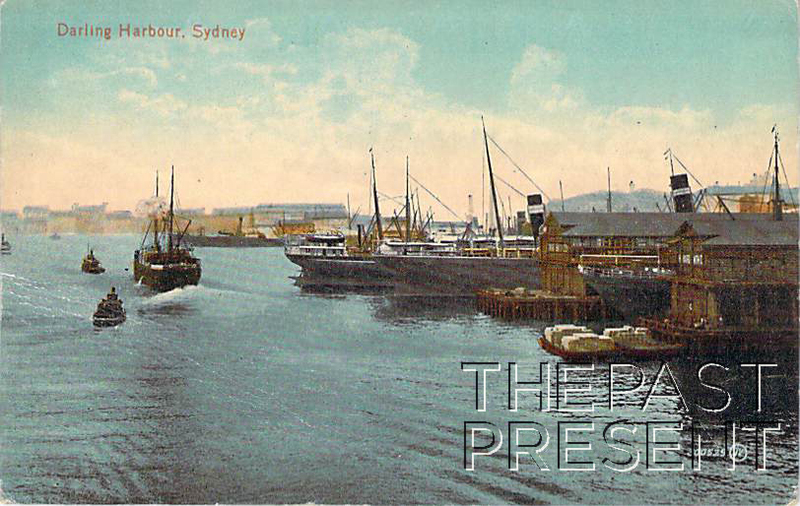 This entry was posted in New South Wales, Sydney and tagged 1910s, commerce, government, industry, postcard collection, sydney, sydney harbour, transport.